After collecting cockroach activity in my collection for more than a year now, I decided to make some graphs. Each graph is made up of 505056 datapoints (measurement every 10 seconds for 2 months). X-axis: hour of the day Y-Axis: Activity level and light level in the enclosure. Among the most interesting ones are the Therea bernhardti graphs. There you can see how the nymphs are active during the night, in contrast to the day-active adults. It might not be hot news, but I thought I'd share a new cockroach that I started breeding. Even when it comes to mainstream species, I always prefer to work with wildtypes (meaning strains that originated from known, wild populations) because I feel there is often too much mixing and hybridizing in the arthropod hobby, leading to weaker captive populations. Nymphs of this roach were collected in a small Honduran cave as an unidentified "Blaberus sp.". It appears to be a variety of Blaberus giganteus, with wide black banding and a darker color tone. Adults begin as white individuals but very quickly turn orange. The funny thing is that I never planned to keep B. giganteus. I avoided them due to their bad reputation - low tolerance for crowding and cannibalism. But this strain seems to be ok with it, I still have all the original adults sharing the space with hundreds of nymphs, and while their wings are no longer intact (well, they use them for courtship after all), they are still kicking. They seem to be very hardy. I just read on http://www.roachcrossing.com/major-life-updates-unanswered-e-mails-facebook-reboot-future/, that Kyle is getting things back in order. That's good news, especially for Kyle himself! I didn't know what had happened last year, but knowing know after reading his message, it has been quite a lot. Well, I wish Kyle all the best (and perhaps we should not swarm him with roach orders )! Kyle: if you happen to read this: Take you time, and I wish you all the best! Beautiful Blaberid from Panama. Males have glossy black wings while females lack wings. Here's a beautiful species from central FL. Their babies hatched yesterday! In case anyone was wondering, Corydidarum and Trichoblatta are now considered synonyms of Pseudoglomeris. Additionally, Corydidarum (Trichoblatta) pygmaea is now Perisphaerus pygmaeus. You can get the full article here. I managed to make some photographs of my new roaches: Corydidarum magnifica. The nymphs are still quite small (8mm / 0.31inch) and I took the photographs through the glass of their tank, so the quality isn't optimal. I started with 7 adult hissers a few months ago. Since then, each of my 3 females has had a brood. The colony is thriving. I made an interesting observation about their eating habits. I've always given them carrots, along with a mix of oats and crushed cat food. The initial couple tablespoons of crushed cat food lasted a couple months when I only had adults. They'd eat the oats around it. This lined up with what I'd heard about their protein demands (that they don't really need much). The nymphs have opposite tastes. They're crazy about the cat food. They eat around the oats. I have to fill the dish every few days when it dwindles to stray oats and frass. It seems to be just the stuff they need, because they're bigger every time I look. Bolder, too, so I see more of them. The audible scuttling of all those tiny legs grows louder by the day. Hello everybody ! I'm an illustrator and I'm currently working on a book about insects (kind of a pop-up book for children in which you can lift the wings of an insect to see underneath for example). I would like to feature in this book the beautiful Simandoa Conserfariam, but unfortunately, I cannot find a picture with a view under the elytras of the full abdomen and the wings (I read that the simandoa have fully developed wings). I contacted shops and even a Natural History Museum, but in vain ! (the museum didn't have a specimen) So I was wondering if one of you guys had some informations on that subject ! Hope I'm posting this in the right forum :) Thank you !! Yep, I've observed this occurance in Parcoblatta pennsylvanica and I bet the same could be true for some other winged roaches as well. Hmm, just slightly on the cooler side then. Exactly how dark is your adult? I kept mine a bit colder than that (at the time the warmest things got were around 70 F I believe) and my adults were nearly solid black so I assume yours might be a bit lighter in color? Now that I'm keeping mine on the warmer side, I'm not seeing any black or even mostly black adults. I cannot believe how huge these are! This guy is bigger than my Eublaberus “pantanal” and my Blaberus fusca. Any Pokemon fans here? Sun and Moon finally gave us a roach pokemon with Pheromosa and it instantly became one of my favorite Pokemon. I love how not only is it powerful, but is also portrayed as beautiful and clean! It reminds me of a Blaberus sp. in particular, especially the coloring on the shiny version. I want to cosplay a humanized/gijinka Pheromosa and do a photoshoot with some of my caves. 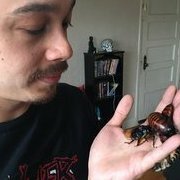 Sorry to hear this, HIsserdude - you've been one of the most helpful and knowledgeable members of this forum and certainly helped me with a few problems I had with my colonies when I started keeping roaches. I hope all goes well and that with a new balance to your life, as Krissim Klaw said, you don't completely lose your obvious love for these little creatures. I can certainly sympathise with the time commitment - having started off with just three hissers about 18 months ago I now have thriving colonies of 6 stick insect species and 3 hisser species, all of which are reproducing like mad and eating me out of house and home as well as taking a lot of my time! All the best and hope to see you here back again some day with a new enthusiasm! Disclaimer: Not trying to argue; comments below are for the sake of myth-prevention Periplaneta americana, the American roach, has been proven to have an excellent memory. https://www.google.com/url?sa=t&source=web&rct=j&url=http://www.bioone.org/doi/pdf/10.2108/zsj.18.21&ved=2ahUKEwi-v8y4uuraAhXPtVkKHaZJAt0QFjAAegQICRAB&usg=AOvVaw2R56gPNwnVV_UMJIwIsV_h Research has also shown that Blattella germanica (German) has long-term memory and the ability to remember cage landmarks for visual navigation. https://www.researchgate.net/publication/255641206_HOW_DO_BLATTELLA_GERMANICA_L_AGGREGATE I don't know what species you keep, but: These two houseroaches belong to different superfamilies and are built similarly to most roaches; it is thus rather safe to assume that other roaches with "typical" habits have similarly good memory capacity as well (of course, some roaches with extremely unusual biology might have reduced memory capacity to improve biological fitness). Conclusion: Your roaches' apparent poor memory is probably not a poor memory at all. One likely possibility is that they are simply just being instinctively paranoid (better to err on the side of caution) and are thus too timid to habituate to your handling when you lack food. Good luck to you!! My female and male mated last night, and now Layla is nymph bound. Marcus is being a typical dad. LAZY. I’m letting them crawl on me while I type. Layla is gonna be a great mom I would post a pic of Marcus on my head.... but I am not revealing my face, thank you. I'm not sure they really can be bred for size, isopod size seems to correlate directly with available space and hides. Big, bustling colonies have average sized to small mature specimens, while smaller, frequently culled populations with lots more hides and surface area available get much larger. At least, this is what I've observed with most of the isopod species I've kept. So far it looks like Corydidarum magnifica is mostly active during the day, and much less at night (diurnality). They often wander over objects, making them quite visible. I wonder if their shiny colors and looks are a kind of mimicry for some kind of foul tasting beetle in their natural habitat? cat food or dog food or chicken food or fish food?